A great little product for washing with if you have eczema - and amazing value too! I'm always on the hunt for new products to try in the hope that something will get rid of my eczema. After going to the doctors about my eczema and being prescribed creams with an anti-bacterial and anti-fungal element in them (as well as a hydrocortizone/steroid element) it got me thinking. The doctor said that the reason my eczema had got so bad was because it had got infected, hence the anti-bacterial/ anti-fungal. I know that using steroid creams regualrly for eczema can be damaging to your skin in the long run so I wondered whether there was something that I could wash my whole body in that would have this anti-bacterial/ anti-fungal but without the damaging steroid cream. As my eczema is on large areas of my back, middle and legs, something to wash with would make much more sense than small tubes of thick eczema ointment. So I got to Googling. As you do. It took me a while to find anything but eventually I stumbled across MediMix soap. It's an ayurvedic herbal soap and has 18 different herbs in it. 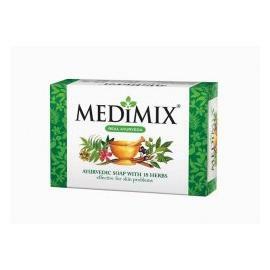 The list of herbs and the properties they have made MediMix soap sound ideal as an eczema treatment. Antibacterial, antiviral, deodorant, repels parasites from the body. Coolant to body, acts against wet and dry eczema. Antiseptic, antibacterial, antiviral, anti-inflammatory agent, deodorant. Improves smoothness of skin, prevents diseases vitiated by kapha dosha. Provides pleasant body odour, coolant to body, prevents prickly heat. Improves complexion, acts as a sunscreen, removes excess sebum. Coolant, prevents excessive sebum secretion. Antifungal, acts against dematophytes, anti-dandruff, useful in many skin problems. Proven medicine against psoriasis and vitiligo (switram). Effective against all sorts of parasitic organisms. Coolant to skin, prevents excess sebum secretion, prevents itching, removes bad body odour and prevents prickly heat. Prevents prickly heat, prevents itching, gives a pleasant body odour, antiseptic. As you can see there are lots of antibacterial and antifungal ingredients in it as well as herbs designed to cool the skin and relieve itching. The soap has a coconut oil base too. The MediMix soap was only £1.25 (very cheap compared to a lot of the products I have ordered), so I bought a couple of bars just to justify the postage. The soap has quite a strong smell, but just smells like ordinary soap (normally the last thing I would consider using for my eczema. It's just a plain green bar of soap. It lathers quite nicely - I used it all over my body and it didn't sting or aggravate my eczema patches. My skin felt quite dry and tight after using it though, as you might expect from a soap. And squeaky clean. I've been using the MediMix soap for a couple of weeks now and must say that I quite like it and I do feel like I've been itching less as a result. Is this just psychological? The drying effect the soap has on my skin though has meant that I have a renewed need for a basic all-over body lotion/ moisturiser though. I feel like if I could just pair this soap with a good sensitive skin lotion I'd be on to something good. The soap isn't a miracle cure for eczema and annoyingly it contains perfume. I don't understand why you would put this in a soap aimed at curing skin problems? Maybe it's to overcome the strong smell of the various herbs. One of the main anti-bacterial and anti-fungal ingredients in the Medi-Mix soap is neem, which is a natural ingredient with properties like tea tree oil but stronger. I might look out for some neem products for sensitive skin without any perfume in them. In the meantime the soap seems pretty good. I've been using this soap pretty much ever since. I've tried a couple of other things but always go back to this, partly because the MediMix soap also keeps my spots away (sadly it is still possible to have very dry skin and still get spots on your chin at certain times of the month.) Now I have a moisturiser my skin likes, the combination is working pretty well. You can also wash your hair with MediMix soap. Oh man this soap looks insane. It has so many herbal ingredients you can't imagine what the active ones might be! I'm guessing that you might want to (somehow) try one ingredient at a time, to see whether any of them have positive/negative effects. E.g. if neem is stronger than tea tree oil I'd be very wary of it-- it's likely a skin irritant. Thanks for reviewing this stuff though. Useful and interesting to read.